William Young Ottley; Samuel Woodburn, London; Sir Thomas Lawrence (Lugt 2445); Samuel Woodburn, London; Lord Francis Egerton, first Earl of Ellesmere (Lugt Supp.2710b) and by descent (sale, Sotheby's, London, 11 July 1972, no. 13); Yvonne Tan Bunzl, London; NGA purchase in 1975. The Lawrence Gallery, Sixth Exhibition, Messrs. Woodburn's Gallery, London, 1836, no. 20. The Ellesmere Collection of Old Master Drawings, Museums and Art Gallery, Leicester, 1954, no. 17 (P. A. Tomory). Drawings by the Carracci and Other Masters, P. & D. Colnaghi, London, 1955, no. 5. NGA Master Drawings 1978, p. 48. 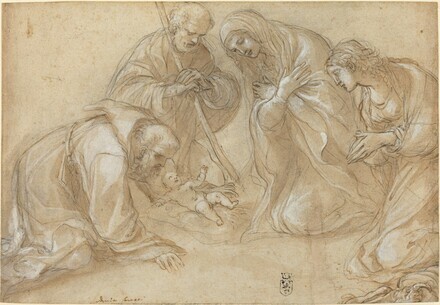 Correggio and His Legacy, Sixteenth-Century Emilian Drawings, National Gallery of Art, Washington, 1984, no. 120 (Diane De Grazia). Correggio e il suo lascito, disegni del cinquecento emiliano, Palazzo della Pilotta, Parma, 1984, no. 120 (Italian version of the Washington exhibition). Coulanges, Henri. "Les Carrache, trois pionniers d'un retour au réalisme," in Connaissance des Arts, no. 244 (June 1972): 107, fig. 6. Bohn, Babette. "The Drawings of Ludovico Carracci." Ph.D. dissertation, Columbia University, New York, 1982: 292, no. 167.